The Rosetta science team has now made available to the public all 70,000 images taken by the spacecraft’s high resolution camera. Between 2014 and 2016, the scientific camera system OSIRIS onboard ESA’s Rosetta spacecraft captured almost 70000 images of comet 67P/Churyumov-Gerasimenko. They not only document the most extensive and demanding comet mission to date, but also show the duck-shaped body in all its facets. In a joint project with the Department of Information and Communication at Flensburg University of Applied Sciences, the Max Planck Institute for Solar System Research (MPS), head of the OSIRIS team, has now published all of these images. The OSIRIS Image Viewer is suited to the needs of both laymen and expert and offers quick and easy access to one of the greatest scientific treasures of recent years. The Rosetta archive can be found here. According to an Associated Press report today, the Falcon Heavy core stage was damaged when it toppled over in heavy seas, but was not entirely lost. The company confirmed Tuesday that the unsecured core booster toppled onto the platform over the weekend, as waves reached 8 to 10 feet. SpaceX chief Elon Musk says the engines seem OK. There’s no immediate word on how many of the booster pieces remain on board. Musk says custom devices to secure the booster weren’t ready in time for this second flight of the Falcon Heavy. From this report it sounds like the engine part of the stage remained on the barge. We shall see. Also, this report might explain the lack of a robot to secure the stage. The robot wasn’t ready, but rather than delay the launch for this reason they went ahead. Did an interstellar meteor hit the Earth in 2014? By analyzing the speed in which it traveled through the atmosphere, astronomers propose that a meteor that hit the ground in 2014 was probably an interstellar object. The scientists analyzed the Center for Near-Earth Object Studies’ catalog of meteor events detected by U.S. government sensors. They focused on the fastest meteors, because a high speed suggests a meteor is potentially not gravitationally bound to the sun and thus may originate from outside the solar system. The researchers identified a meteor about 3 feet (0.9 meters) wide that was detected on Jan. 8, 2014, at an altitude of 11.6 miles (18.7 kilometers) over a point near Papua New Guinea’s Manus Island in the South Pacific. Its high speed of about 134,200 mph (216,000 km/h) and its trajectory suggested it came from outside the solar system, the scientists said. “We can use the atmosphere of the Earth as the detector for these meteors, which are too small to otherwise see,” Loeb told Space.com. The meteor’s velocity suggested it received a gravitational boost during its journey, perhaps from the deep interior of a planetary system, or a star in the thick disk of the Milky Way. To put it mildly, there are a lot of uncertainties about this conclusion. Nonetheless, their approach and hypothesis is very intriguing, and seems logical. SpaceIL’s investigation into the landing failure of its Beresheet lunar spacecraft now suggests that a ground command to reactivate a balky inertial measurement unit (IMU) might have caused the main engine to shut down. A command intended to correct a malfunction in one of the Beresheet spacecraft’s inertial measurement unit (IMUs) led to a chain of events which turned off its main engine during landing, according to a preliminary investigation conducted by SpaceIL. …A chain of events caused by a command sent from the SpaceIL control room turned off the spacecraft’s main engine and prevented proper engine activation, Anteby said, rendering a crash-landing on the Moon inevitable. It is still unclear how a command to one shut down the other, but the investigation is still on going. I suspect they will pin this down to a software design issue. An eveing pause: Sadly, I think these characters are maybe more connected to reality than many we presently have in office. R.I.P. Skylab astronaut Owen Garriott has passed away at 88. From a different time and place. SpaceX announced today that it lost the Falcon Heavy core stage in rough seas on its way back to port. “Over the weekend, due to rough sea conditions, SpaceX’s recovery team was unable to secure the center core booster for its return trip to Port Canaveral,” SpaceX spokesman James Gleeson told FLORIDA TODAY. “As conditions worsened with eight- to ten-foot swells, the booster began to shift and ultimately was unable to remain upright.” “While we had hoped to bring the booster back intact, the safety of our team always takes precedence. We do not expect future missions to be impacted,” he said. While SpaceX does have hardware on its drone ship designed to secure first stages – often referred to as a flat “robot” that holds them in place – it was not used for this mission, which successfully took an Arabsat satellite to orbit last Thursday. The connections between the robot and center core aren’t compatible like they would be with a standard Falcon 9 booster, but SpaceX is expected to upgrade both in the future. This is unfortunate. At the same time, it illustrates how far ahead of its competitors SpaceX is. While others throw their first stages away, SpaceX is disappointed when it loses one. An evening pause: By Irving Berlin. Cool image time! The photo on the right, cropped, reduced, and brightened slightly to post here, was part of the April image release from the high resolution camera on Mars Reconnaissance Orbiter (MRO). 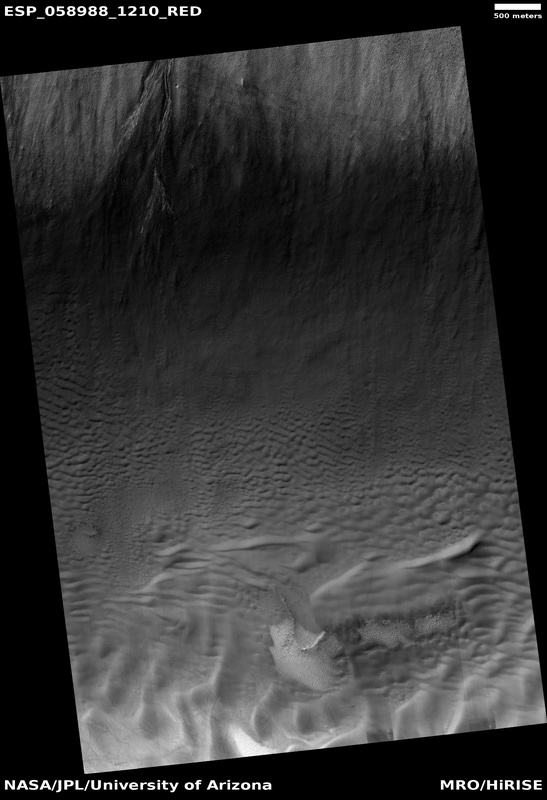 According to the titled of this release, it purports to show visible frost on what looks like an avalanche debris slope on the rim of a large crater. The frost is the bright streaks on the upper left of the slope. I wonder. 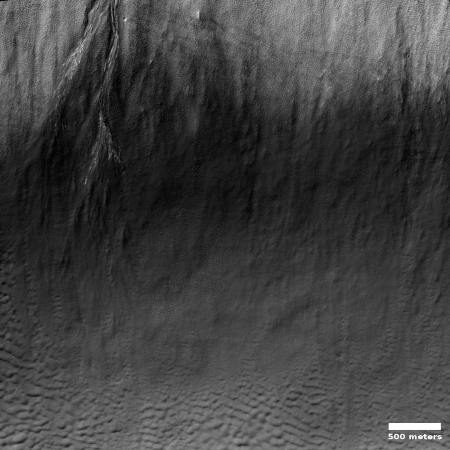 During last month’s 50th Lunar and Planetary Science Conference in Texas, there was one paper that I reported on that showed something very similar to this, and proposed that white streaks like this in a gully were actually exposed snow/ice. They proposed that the snow/ice was normally covered by dust, and the white streaks were where the dust had blown away to reveal the ice below. This in turn would then sublimate into gas, which in turn would cause the gully avalanches over time. Below is a close-up of the white streaks on this rim. Scientists using the space telescope TESS think they may have found its first Earth-sized planet. In other words, they know almost nothing yet about the smaller exoplanet. They think it is similar in size to the Earth, but they don’t know its mass or composition. Link here. This is a review of new book called Armies of Sand: The Past, Present, and Future of Arab Military Effectiveness by Kenneth M. Pollack. Essentially, Arabian armies in the past century have routinely done terribly on the battlefield, and Pollack traces that failure to the culture of Arabia rooted in Islam. In other words, the clan rules, no matter what, from the top down. Individual skill is given low priority, and in fact superior talent and intelligence can be seen as harmful if it threatens the cohesion of the group. The problem is that such authoritarian systems, no matter how weak and faulty, can gain power, and squelch freedom and achievement. It was this kind of thinking that brought on the Dark Ages in Europe. Though not quite the same, during the medieval era the feudal system honored group thinking far above individual creativity, and in fact saw such achievement as a threat. The result was a thousand years of decline. Unfortunately, we in the west are increasing accepting a variation of this thinking. Like the Dark Ages, it is increasingly considered bad to stand out as a free-thinking individual. If a twitter mob attacks, you damn well better kowtow, or face personal destruction. Society will not respect your individual rights. The new colonial movement: The United Arab Emirates (UAE) has named the man who will fly on a Soyuz rocket in September to become that country’s first astronaut. “The Emirati astronaut Hazzaa AlMansoori will fly for an eight-day space mission to ISS aboard a Soyuz-MS 15 spacecraft on 25 September 2019,” the organization said in a Twitter post late on Friday. The UAE astronaut’s flight to the ISS is scheduled for September 25. He will spend about a week on board the ISS and will return back to the Earth with the Soyuz crew. Currently, there are two Emirati nationals prepping for the flight in the Yuri Gagarin Cosmonaut Training Center. The other astronaut, Sultan Al Neyadi, will serve as a backup. No background was given on this man, but we will find out more with time. Capitalism in space: The head of the private Israeli company SpaceIL has announced that he has found funding to build a second Beresheet lunar lander, and that they will try again. How much funding he has gotten is not clear, but I suspect that the success his company had in getting to lunar orbit and almost landing will encourage investment capital. Capitalism in space: Stratolaunch’s giant two fuselage airplane Roc successfully launched on its first flight this morning. It took off at 10 am Eastern, and as I write this the plane apparently is still in the air. Update: They have landed successfully, completing the first flight..
Below is video of the plane’s take off. This plane, the largest ever to fly, is quite impressive. Capitalism in space: In a tweet yesterday Elon Musk said that SpaceX had recovered both fairings from the Falcon Heavy launch and plans to reuse them later this year. It seems that what the company has found is that catching the fairings is not necessary. Providing them parachutes and a guidance system so they land gently with the open half up, so they float literally like a boat, prevents any serious damage. The guidance system also gets them to land close enough for a quick pickup at sea. Musk told reporters last year that the fairing costs around $6 million. He said the first stage of the Falcon 9 rocket comprises about 60 percent of the cost of a launch, with the upper stage responsible for 20 percent, and the fairing another 10 percent. The remaining 10 percent of the cost of a Falcon 9 mission come from charges stemming from launch operations, propellant and other processing expenses, Musk said last year. In other words, by recovering both the first stage and the fairings, SpaceX makes their rockets about 70 percent reusable. That’s actually more reusable than the space shuttle ever was. I must add that the section of the shuttle that was the most reusable was the section of SpaceX’s rockets that they as yet are not reusing, the upper stage. In other words, we have now tested and proven the technology for making an entire orbital rocket reusable, just never in the same vehicle. SpaceX is taking advantage of this knowledge and clearly applying it to their Super Heavy/Starship next generation rocket, which also means the likelihood of getting that to work is actually quite high and not as radical as many think. Yesterday’s magnificent successful launch of SpaceX’s Falcon Heavy rocket elicited numerous news stories from the general press, most of which were reasonably accurate if very superficial in their coverage. As a space guy who focuses on this stuff, I find that much of the reporting in the mainstream press reads as if the author has just discovered the subject, and is scrambling to come up to speed quickly. This CNN article is typical. The journalist gets most of her facts right, but her lack of context because she hasn’t been following the subject closely causes her to not understand the reasons why the Falcon Heavy will fly less than the Falcon 9. The basic facts in this quote are entirely true, but it somehow implies that the Falcon Heavy is simply not that much in demand, which isn’t true. The reason Falcon Heavy has approximately one quarter of the missions of the Falcon 9 is because it is still new and it hasn’t yet garnered the customers. Also, as a slightly more expensive rocket than the Falcon 9 ($90 million per launch vs $60 million) fewer customers are going to buy it. Still, the Falcon Heavy has more than five missions upcoming, with contracts for at least seven launches, by my count, and having this many contracts this quickly is remarkable, considering the rocket’s newness. It is more than the Russians are getting for their Proton rocket, around since the 1960s. And it is almost as many contracts as both Arianespace and ULA are each getting on a yearly basis. Falcon Heavy is clearly becoming a big financial success, and will in the next few years I think routinely fly three to four times per year. There is a lot of demand for it, which will only grow with time. This flaw in getting the background right by the CNN reporter is not really a big deal, but it does illustrate why it is better for ordinary citizens to get their news not from generalists in the mainstream press but from specialists in each field (such as myself), who understand the details more closely and can get the context right. However, every once in awhile the mainstream press publishes a story that is so egregious and badly written that I think it necessary to give it a public pan, if only to make others aware of that this kind of bad journalism is not unusual. I also admit that it can be quite entertaining to highlight this pitifully bad journalism. Yesterday one of Houston’s local television stations, KPRC-TV, published its own quick report on the Falcon Heavy launch. And boy, was that report a facepalm. The Hayabusa-2’s science team has scheduled their first observations of the artificial crater the spacecraft made on the surface of the asteroid Ryugu for April 25. The probe will observe the crater, which was generated during an impact experiment on April 5, from a height of 1.7 kilometers. JAXA will collate the data with photographs of the surface taken near the impact point to measure the size and location of the crater. It will also examine the dispersion of rocks and judge whether Hayabusa2 can land to take samples. This is only their first assessment. Once they feel comfortable about getting closer, they will then plan the spacecraft’s second touchdown and sample collection, this time hopefully from within that crater. Despite the failure of its Beresheet lunar lander to land softly on the Moon yesterday, the private company SpaceIL has been awarded a one million dollar prize by the X-Prize for its success in getting into lunar orbit and coming as close as it did to successfully landing. “As a testament to the team’s passion and persistence, we are presenting this one million dollar Moonshot Award to the SpaceIL team at our annual Visioneering Summit in October 2019, with the hope that they will use these funds as seed money towards their education outreach or Beresheet 2.0, a second attempt to fulfill the mission,” said XPRIZE CEO Anousheh Ansari. The article also outlines some details about the failure. The main engine cut off during descent, and though they were able to get it restarted, the spacecraft was now too close to the surface and traveling too fast to slow it down. They are now assessing their data to figure out why the engine cut off as it did. Capitalism in space: Virgin Orbit has signed an agreement with the European launch services provider Exolaunch to provide launches for it appears as many as 20 smallsats. Exolaunch, a spinoff of the Technical University of Berlin formerly called ECM-Space, has arranged launches, managed missions and integrated small satellite rideshare clusters for customers in Europe and North America. Exolaunch customers include startups, universities, scientific institutions and space agencies. In 2019, Exolaunch is under contract to send more than 60 small satellites into orbit. Forty of those satellites are scheduled to fly together on a Russian Soyuz rocket this spring or summer. It appears that this agreement covers those 20 additional satellites, but the announcement is vague, probably because Virgin Orbit has still not completed its first launch. Until it does so, many of its launch contracts will be somewhat tentative, with its customers keeping the option to withdraw. Capitalism in space: One week after dropping its protest for losing the bidding competition for the Lucy asteroid mission, SpaceX has been awarded by NASA the launch contract for its Double Asteroid Redirection Test (DART) mission, set for launch in June 2021. The $61 million launch price is significantly lower than past NASA contracts for Falcon 9 launches. NASA awarded SpaceX a contract for the Sentinel-6A satellite in October 2017 for a November 2020 launch on a Falcon 9 from Vandenberg at a total cost of $97 million. The Surface Water and Ocean Topography (SWOT) satellite will launch on a Falcon 9 in April 2021 under a contract awarded in November 2016 at a value of $112 million. This low cost technology test mission, costing a total of $9 million, was initially going to be launch as a secondary payload. That NASA is now going to pay SpaceX for a full launch is most intriguing. It seems to me that there might be a bit of quid pro quo here. NASA wanted that protest dropped, and offered this launch to convince SpaceX to do that, as long as the launch cost was kept low. $60 million is really SpaceX’s standard price for Falcon 9 launch, using new boosters, but for NASA that is the least they’ve paid. How much more this is than what NASA would have paid to launch DART as a secondary payload is the real question. An evening pause: In honor the various space related engineering daring-do today, let’s watch a modern fighter jet show off at an air show. I have embedded the live stream of Falcon Heavy launch below the fold. It does not go live until just before launch, which is now scheduled for 6;35 pm (Eastern). The live stream is now live. I will post updates below, so refresh your screen to see them. This is not a routine SpaceX launch, where we have become nonchalant about the company’s ability to vertically land a first stage. They admit getting the core stage back will be challenging. They also admit that this is essentially a countdown of three rockets, so they are going to be very conservative. If anything pops up during countdown, they will scrub and try another day. The side boosters have successfully separated. The center core stage has successfully separated. Re-entry burns for the two side boosters has been completed. Re-entry burn on the core stage has been completed. 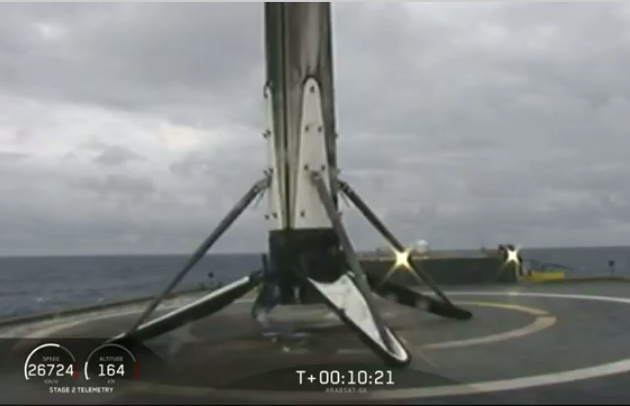 Both side boosters have landed. The payload is in orbit. The core stage has landed successfully on the drone ship. Though the satellite has not yet been deployed, the rest of this mission is almost certainly going to go as planned, as it is essentially identical to a normal Falcon 9 launch. Update: payload successfully deployed! Getting all three stages back is a notable achievement. They intend to recycle the two side cores and use them on the very next Falcon Heavy launch in June. The core stage will likely be reused as well but when has not yet been announced. The U.S. leads the pack 7 to 4 in the national rankings. I should add that I am being generous to include China’s Long March 5 in this heavy lift list. It really doesn’t qualify, but it remains the only other near competitor.